Debbie and John Hooper took their cherished Chevy Camaro ZL1 to the dealer under warranty to fix a minor paint problem. Then they allege they got a call from the dealer saying they'd wrecked the car. Now they've offered a replacement, but it might not be enough. The Hoopers didn't just buy their show-worthy black ZL1 for $60,000. They had to trade in a 2011 Camaro SS and also sell their pristine 1969 Camaro SS as well to get the new car. By all appearances, they loved their ZL1. So you can understand their shock when the Georgetown Chevrolet (one dealership run by First State Chevrolet in Delaware) called them to say that one of their employees took out their car, went on a joyride, lost control, and crashed into a telephone pole. 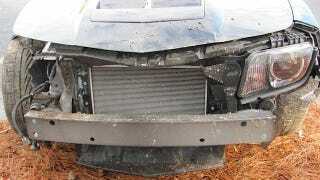 As John Hooper explained on this post on the Camaro5 forum back in December, the dealership killed their car and didn't do a thing to help them. On Sunday, December 15, 2013, my prized 2012 Camaro ZL1 took its last breath at 4:47 pm. The car was at the dealer in Georgetown, DE for paint issues (under warranty). It had been locked in the service bay over the weekend. On Sunday afternoon, an employee of the dealership (service writer) entered the locked building, removed the keys to my car from the service department, and went on a joyride. The car was totaled when he lost control and sheared off a telephone pole. The dealership informed my wife and I on Monday morning at 9:00 a.m. of our loss. Yes, they waited over 16 hours to tell us about our car. I am sure they discussed the incident with their attorneys prior to calling us. It is now Friday, the car has been officially totaled by the insurance company, and the dealership is telling us it is not their problem. They even refuse to provide my wife and I (and our insurance company) with their insurance information. And the outlook didn't look rosy from there. I will never be able to afford another new ZL1, and basically I don't think I should have to be put in the position to have to buy a new one. We trusted the dealership to use vigilance while our car was in their possession. We can't even have charges pressed against their employee for theft because the car was not in OUR possession when stolen. Something about this whole thing just doesn't seem right. What would you do if this was your baby? And don't think that John is telling a tall tale. The local Cape Gazette reports that the Delaware State police charged Eric Peterson with careless driving and failure to have insurance identification in possession. First State Chevrolet owner Bob Hansen told the Gazette that Peterson isn't working at the dealership anymore. That all happened in the middle of December. On the 30th, the dealership told him they would finally be making good with replacing his car, at least that's what John thought, as he explained in this forum post. In this post from two days ago, however, John revealed that the dealership didn't do the right thing at all — they offered to sell him another ZL1. It was in worse condition than the one he had before and while the dealership claimed their replacement ZL1 was a one-owner car, it really was a two-owner car. I have been patient. I finally got a call on Monday (1/6) to come over to look at the car they "found" for me. They were sure I would be pleased. Imagine my surprise when the car they "found" turned out to be a trade-in on a new Stingray. The car was a 2012 ZL1, black like mine, but with a sunroof (which I do not want), 34% more miles than mine, new tires (why did it need new tires at 13,588 miles? ), different wheels than mine, non-Chevrolet emblems front and back, and tinted windows. Also absolutely NO documentation on the car, even though I was told the car had more documentation than mine. I was not even told the mileage on the car until I went out and sat in it for myself. Amazing that we had to go over all the figures first. And yes, I was to buy this car from them. They did offer $4K "feel good" (their words, not mine) money to buy the correct emblems and rims. However, nothing was mentioned about a lower price for the higher mileage. John and Debbie left the dealership, not happy with the proposed car. They went on the Camaro5 forum and ordered themselves a CarFax, only to find that the car had two owners not one, and that it had been involved in an accident. So they were basically trying to SELL us a 2-owner vehicle that had previous body damage, along with tinted windows, incorrect emblems, more mileage, the apparent need for new tires, and heaven only knows what else. They called today to tell us that their original offer to buy THAT car from them was ALL they were going to (or willing to) offer. Take it or leave it. We really did not want a twice-used car with no documentation and do not feel it was a reasonable replacement for our show-winning, pristine, fully documented car with much less mileage. So folks, almost a month later, I am still making payments on a car I do not have, and certainly cannot drive. And the dealer is unwilling to step up and "do the right thing." That's not how the dealership sees things. I spoke with the general manager at the dealership and they told me they had gone "above and beyond" with their dealings with the Hoopers. The dealership confirmed that they fired the employee "on the spot" and worked to provide a replacement car of not just equal but greater value than the Hoopers' ZL1. The dealership claims to have had their replacement car reviewed by a certified classic car appraiser, and on top of that they offered $5,000 along with the car. This is money outside of any dealings the Hoopers have with their insurance company. The general manager told me that the Hoopers then asked for $11,000 instead of $5,000 to take the replacement car. That offer did not pan out. "I almost think it's extortion," the general manager told me. "I don't think any sane person would turn down [this deal.]" He later concluded, "I almost think they're as bad as the guy who stole the car." The general manager explained that the dealership's insurance told them not to offer any more deals to the Hoopers and to let them either take the existing offer or not. And that's where things stand now. The crux off the issue hangs on whether the dealership's substitute ZL1 is an acceptable replacement or not. The dealership is convinced that it is, and the Hoopers appear to believe is it not. It doesn't look pretty from here on out.